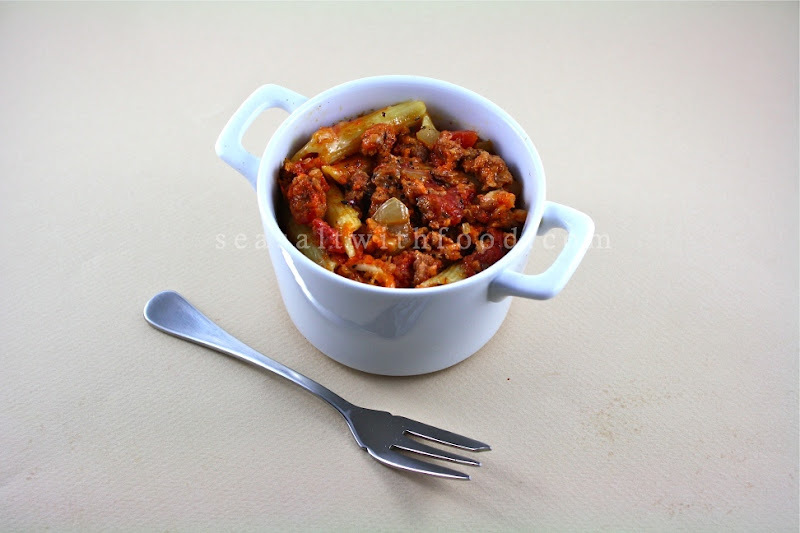 This is a fantastic Baked Penne with Chorizo. 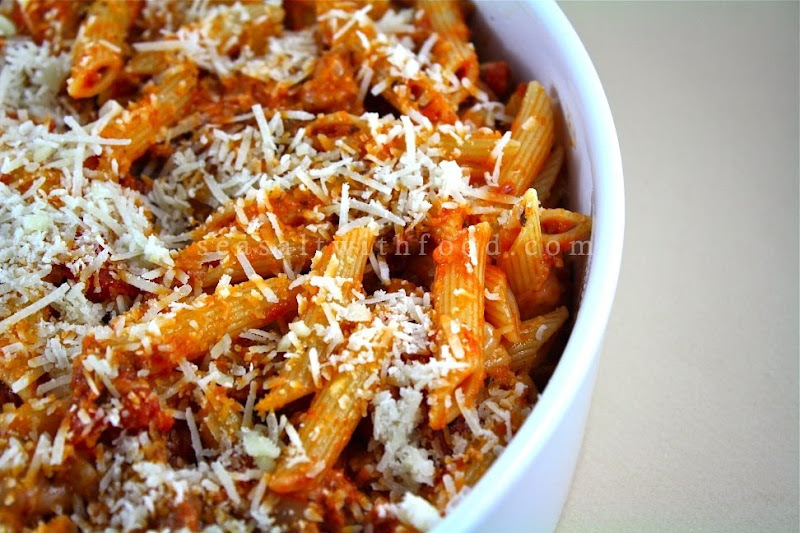 I used some fresh chorizo which are full of flavors and they tastes really good with the penne. I added the penne with mozzarella cheese after cooking the meat mixture, and topped it with some freshly grated Parmigiano-Reggiano cheese. Hmmm…sounds like a good comfort food, doesn’t it? Cook the penne as per manufacturer instructions. Drain the pasta and set aside. 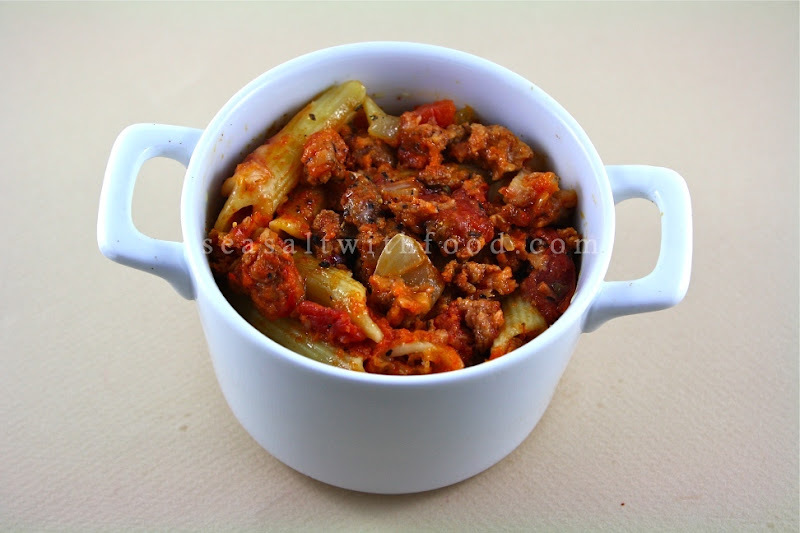 In a large pan over moderate to high heat, cook the chorizo with olive oil. Break the meat apart with a spatula and reduce the heat to low. Then toss in the onion and garlic. Season the mixture with oregano, basil, pepper flakes, sea salt and some freshly ground black pepper. Add diced tomato, tomato paste, and white wine and bring the mixture to a boil, reduce the heat and cook until the sauce is fairly thick. Mix the meat mixture with pasta, mozzarella cheese and half of the Parmigiano- Reggiano cheese and stir until well combine. Transfer the mixture to baking dish and top with Parmigiano-Reggiano cheese and bake in the oven for about 20 minutes or until golden brown on top. Serve warm. This is like a clash of cultures...delicious! This penne looks awesome!!! Love the combo of chorizo, wine and tomatoes. Also digging the individual baking dish. I like this!!! Can I substitute Parmigiano-Reggiano Cheese with tasty cheese or parmesan because that's just what I have in fridge. And how many does this serve? I only need to serve 4. That sounds a lot! Thanks Angie! Hi Quinn, yes you can use parmesan cheese instead. I liked this but the amount of Penne is way too much. I would take it down to 350g. And next time I won't drain so much of the tomato juice as the sauce needs it.